It is amazing what a toy microphone can do! I use many props; however, I find that using this tool produces the greatest effect in my First Steps Class. As you can see in the photograph above, the "attraction" of the microphone really does work. We are learning the numbers -- "1 to 10." I simply put the microphone in front of the children, and they immediately repeat each number after me. "Magic!" The children's names are Nagi and Minato. Their fathers also attend the class. Saturday is their special "Daddy and Child" day. Interestingly, they also like talking into "The Magic Microphone." When greeting people in western cultures (for example, in America) for the first time, making a good impression is important. 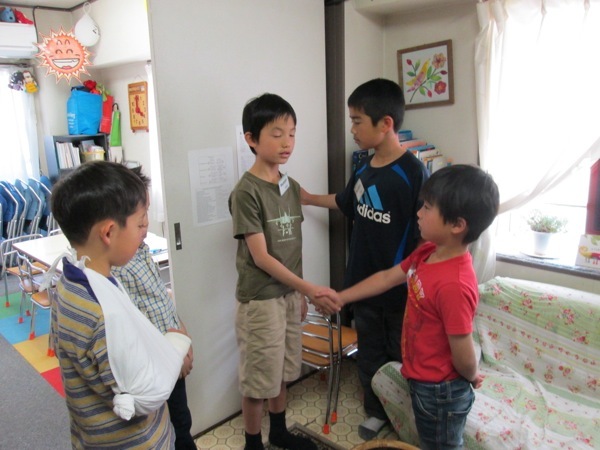 We at Ecole Hibari have been teaching our students how to say "hello" to each other through Lobby English. In the above photograph, a student from another class is meeting someone that he does not know. The following is what they are saying. Musashi: Hello. My name is Musashi Asakura. What is your name? Kanta: My name is Kanta Kawashima. Musashi: Nice to meet you. Kanta: Nice to meet you, too. It is essential for the students to have good eye contact. We also want them to smile at one another. Sometimes this is not so simple for them to do. The instructors are there to insure that the children produce a smile when they do their greetings. Finally, the two of them must shake hands firmly. 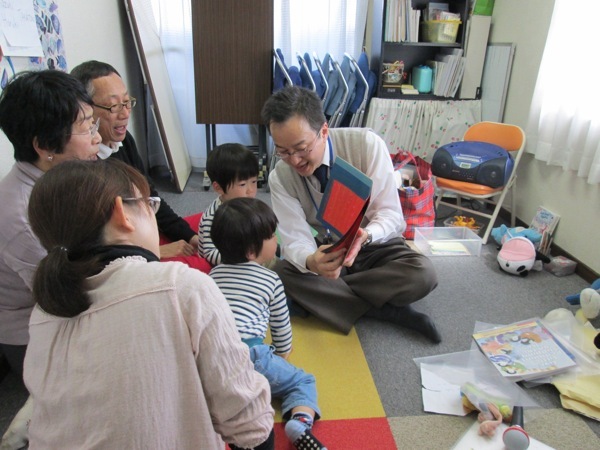 The children at Ecole Hibari enjoy this experience of trying to communicate with one another through English. I would like to introduce to all of you -- Haruki and Kazuki Takato. They are identical twin boys in my First Steps Class on Saturday. In the picture below, you can see the boys, their grandparents, mother, and me. I am reading a book, Cat Sat on the Mat by Brian Wildsmith, to them. As I read each page, the grandparents and their mother repeat after me in unison. This technique helps develop a child's listening skills. Andy: "The cat sat on the mat." Grandparents and mother: "The cat sat on the mat." On every page, I read each line twice in the same manner. We practice with natural speed. It is important for me to focus on correct pronunciation and intonation as I read the book to the children. Their grandparents are a lot of fun in class. They are "full of life." This expression means that they are energetic and optimistic. Most of all, they love being with their grandsons; and I do, too.